Place the sausages in a large skillet and add 1/2-inch water and one tablespoon of the oil, about one turn of the pan. Bring the water to a boil over high heat. Reduce the heat to medium and cook off the liquid, about 8-10 minutes. When the water has cooked off, the oil will begin to crisp the casings. Cook the sausages until browned all over, about two minutes. Heat another large skillet over medium to medium-high heat and add the remaining one tablespoon of oil, about one turn of the pan, and the butter. When the butter melts into the oil, add the bay leaf, garlic, onion, celery and bell pepper. Season the veggies with the thyme, salt and lots of pepper. Cook until tender, about five minutes. Add the flour to the skillet and cook for two minutes. Whisk the beer into the skillet and cook it off, about one minute. Whisk in the broth, tomato sauce, hot sauce and Worcestershire sauce and bring to a bubble. Reduce to a simmer. Add the shrimp and cook until pink, about 2-3 minutes. Place two sausages to a plate and spoon shrimp gumbo sauce over and to the side of the sausages. Enjoy! In Recipes-list.com we have selected the most viewed recipes from category - uncategorized . Enjoy the best recipes specially selected for you! 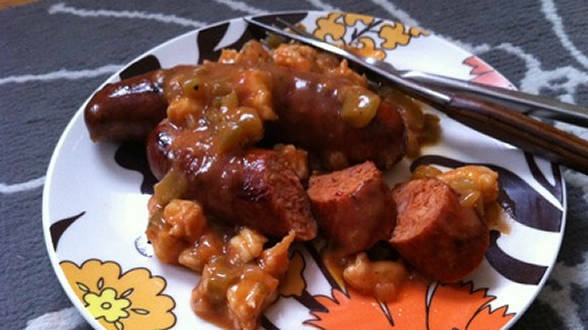 Andouille Dawgs with Gumbo Sauce is the right choice that will satisfy all your claims.